Karma happens, a lot anda always in the face. The Battle of Hill 262 was a World War II military engagement fought between German armored elements and the Polish 1rst Armored Division on Mont Ormel ridge, northeast of Chambois, France, from August 19 to August 21, 1944. The Battle of Hill 262 was part of the wider battle of the Falaise pocket during the Normandy Campaign. The German 7th Army, under the command of SS Obergruppenführer Paul Hausser, had become surrounded by the Allies near the town of Falaise. The Mont Ormel ridge’s military name was Hill 262, which lay in the Germans’ only escape route. With an altitude of 855 ft, Hill 262 offered a vantage point. 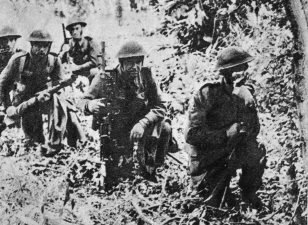 Accordingly, Polish 1rst Division, which belonged to the 1rst Canadian Army, seized the ridge’s northern height on August 19, 1944. Although the Polish forces came under vicious and constant attack, they managed to hold it until August 21. The Polish resolution to hold the Hill contributed to the decisive Allied victory that followed. Once the Poles had reached the summit of Mont Ormel Ridge on August 19, they proceeded, from the safety of the summit, to shell a column of German armored vehicles, which moved through the pass along the Chambois–Vimoutiers road. Nevertheless, the Germans quickly reponded by firing rocket-launchers and anti-tank guns to cover their retreat. On the night of August 19 and August 20, German units that moved out of the Falaise pocket cut off the Polish battlegroups on Mont Ormel ridge. When Lieutenant-Colonel Aleksander Stefanowicz, commander of the Polish 1st Armored Regiment, realized his critical position, he conferred with Koszutski, who was in command of the Polish 2nd Armored Regiment. Not able to fight their way clear, the two decided to hold the ground, since it was the only chance of survival until relieved by stronger Allied forces. After ferocious fighting between the two forces, the German called off their attacks on the Poles on August 21, since they had to get out of the Falaise pocket fast before the Canadian 1rst Army closed in the Allied encirclement. Play this fantastic battle with full Organization and Teamwork!